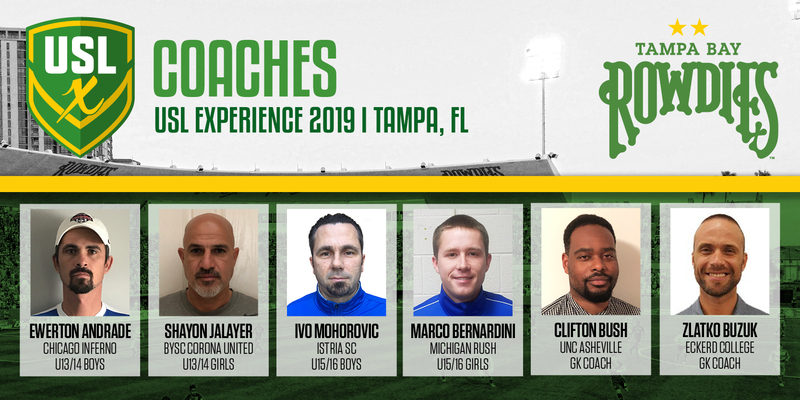 TAMPA, Fla. -Following last week's reveal of the four teams of players announced for the 2019 USL Experience, Super Y League has unveiled the six coaches that help assist the squads this year. 2019 USLX will feature four head coaches -- Shayon Jalayer (U13/14 Girls), Ewerton Andrade (U13/14 Boys), Marco Bernardini (U15/16 Girls) and Ivo Mohorovic (U15/16 Boys) -- who have each served as coaches across the SYL landscape. Meanwhile, the goalkeepers will be coached by Clifton Bush and Zlatko Buzuk. Bush is currently an assistant and goalkeeper coach for the UNC Asheville women's soccer team, while Buzuk is the men's goalkeeper coach at Eckerd College. USLX will head to Tampa -- home of United Soccer Leagues -- this year as it enters its fourth edition in 2019. The event has previously been held in Cincinnati, San Antonio and Phoenix in conjunction with FC Cincinnati, San Antonio FC and Phoenix Rising FC. The 2019 event will feature four teams, with U13/14 and U15/16 Boys and Girls teams. USLX will be held from April 11-14 as USL Championship side Tampa Bay Rowdies play host.